A lot can be learned from data and tracking it. For example, in radio and television, there are Nielsen ratings. You analyze ratings by the week, month or over a year to develop and see a trend. Is the station or program going up or down? Trending up is good. Trending down is bad. One of my recent blogs focused on AM radio no longer having the time to correct problems with its technical limitations and the increasing interference from consumer devices and other AM stations. The Federal Communication Commission (F.C.C.) has said they have a plan to help! But, their two-year old plan has never been implemented. But, lucky for those of us in radio and our listeners, at least they do have a plan, agree or disagree with it. One of the genius ideas to help struggling AM stations and to safeguard the survival of the AM band is to put the programming of these stations on very low powered signals or translators on the FM band. It’s just another weak signaled FM translator, among thousands of others, causing interference to other high power stations on the FM dial. I call it the “AM-ization” of the FM band, because one of the interference issues on AM is there are too many stations interfering with each other, especially at night when an AM signal travels farther. There are plenty in the radio industry ignoring this “AM-ization.” But, you can’t ignore basic psychics. Back in the day when Radio Shack actually sold radios! In fact, numerous state broadcasters associations have now begun to speak out about the interference from LPFM or low power FM stations to existing stations. Have you ever asked why your favorite FM station doesn’t come in as good as it used to or why you can’t pick it up on the fringes of your city like you used to? Non-believers of “Am-ization,” look at the data. Decades ago the F.C.C. shoe-horned directional and daytime AM stations anywhere one could fit on the band. Now, the F.C.C. has allowed massive increases in licensed FM signals over the past 10 years. 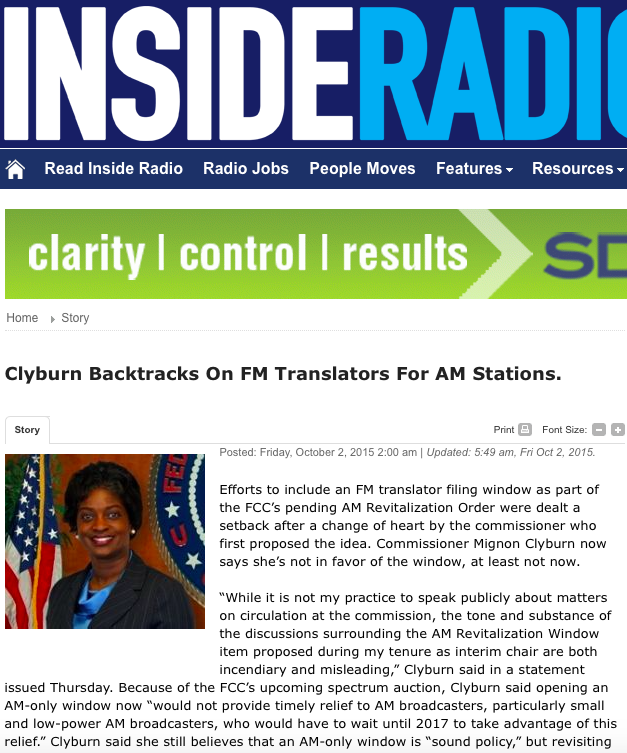 Remember, there are just 101 assignable FM channels available in the U.S.
Two years ago, the F.C.C.’s acting Chairwoman Mignon Clyburn revealed the plan to help AM radio stations at the National Association of Broadcasters (N.A.B.) Fall Radio Show in Orlando. Part of the plan was her support to allow AM operators a one-time, exclusive window to apply for these low power FM translator licenses. But, here’s a shocker. Two years later, her opinion has changed! May be she considered basic physics or realized you can’t help the AM band by giving its station owners FM signals or as she now says favors allowing current translators to be moved up to 250 miles. This, supposedly, is to speed the F.C.C.’s help to struggling AM operators. Then again, the inaction by the F.C.C. to help the AM band by its former cable and wireless industry head lobbyist and current Chairman Thomas Wheeler is either about freeing up that spectrum space for his buddies at AT&T and Verizon or just kicking the can down the road. After all, the November 2016 elections are coming up and there will be a new person occupying the chairman’s seat at the F.C.C., causing regulatory help for the AM band to be put off for many more years. With the 1% decrease in the number of AM stations over the past 10 years, the marketplace, sadly, is determining the future of AM broadcasting. Remember, trending down is bad. We’ve moved an hour N or Dallas, on a Lake. The “free” AM and FM radio stations from both southern OK and northern TX are just horrible. About 4 stations come in clear…(2 of the 4 are in Spanish.) One of the 4 (Great Oldies Station) goes OFF THE AIR at 5 pm! Unbelievable!!! i Wanted to comment on another forum but it was locked. For us old listeners, There were a lot of complaints about picking up regular FM band broadcasting 88-107 FM Mhz band. I think lusful was right. I have a Jensen top of the line unit and it won’t pick up like the old units did. I think that everyone is going media and there is no emphasis on making a good receiver in that band anymore so they skimp on engineering and parts that had once gain that extra sensitivity. Everything now is either Pandora or XM satellite. I may be wrong but that is my opinion. Mobile car units with those bands I think have suffered. I used to be able to pick up stations with no problems where they were strong. I don’t know but this new thing called frequency re-use may have something to do with it. I just don’t think it is the same but I could be wrong. You are so correct Darryl. I have moved to Texas 80 miles from Houston. Would love to listen to WLW because I know the skywave is here. However in the FCC’s ultimate wisdom, they decided to give someone 1 kilowatt at night on 700kHz….just enough to mess up everything for miles and miles. They were called “Clear Channels” for a reason. 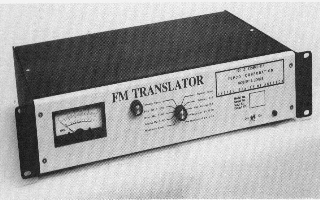 With regard to translators……if you can’t run an AM, what makes them think they will do any better with an LPFM? The ultimate solution is a fairly simple one, accomplished in just two steps. First, open up the 76-88 MHz bands vacated by television channels 5-6. Then announce a 10-year sunset period for the entire AM band, along with a priority for current AM stations to apply for a station of up to 25,000 watts within the 76-88 band. Once that’s complete, address another building penetration issue by allowing LPFM operators to move to remaining open slots on 76-88 MHz along with an ERP bump to 500 or even 1,000 watts.